Marine Le Pen’s Front National (FN) knows it. In 2015, the FN mayors of the south-western town of Arveyres and the Burgundy town of Chalon-sur-Saône ruled to eliminate the so-called “substitute meals” for students with religious dietary restrictions. In practice, that meant eliminating the no-pork options from the menu. “Pork or nothing,” a Muslim French nurse and mother was told by her City Hall just outside of Paris. France is a European exception in trying to accommodate the religious dietary restrictions of Muslim children. Some cities in the United Kingdom offer halal menus to children and Spanish schools offer no-pork or vegetarian options. Neither of these measures is uncontroversial. In the United Kingdom and Denmark, some animal right supporters oppose Muslim and Jewish ritual slaughter practices as inhumane. In Spain in late 2014, dozens of Muslim parents removed their school children from the school canteen in the Valencian town of Alzira. They demanded a halal menu for their children. No-pork and vegetarian menus, which they had been guaranteed for the previous 9 years and are also offered to Muslims in prisons and hospitals throughout Spain, were no longer enough. The school, city, and regional administrations argued that nowhere in Spain are halal menus offered to Muslims in the care of state institutions, and that no-pork or vegetarian menus already guarantee the rights Muslims where given in the State-Islamic Commission of Spain Agreement signed in 1992. “Eating together has a long history of symbolizing peaceful acceptance among peoples of differing cultures,” Donna Gabbaccia reminds us. Jean-Paul Beneytou, the mayor of Chilly-Mazarin–representing Nicolas Sarkozy’s right wing Les Républicains party–conveniently followed the lead of the FN and eliminated the no-pork menu from schools. Beneytou argued that “it is important that everyone be served ‘the same’ food.”3 Rather than thinking of a universal menu, Beneytou insisted that “living together” requires eating pork. Devout Muslim parents are unlikely to acquiesce. The FN is thus indirectly promoting the establishment of private Islamic schools in France, a measure which has all the ingredients to become a recipe for disaster. 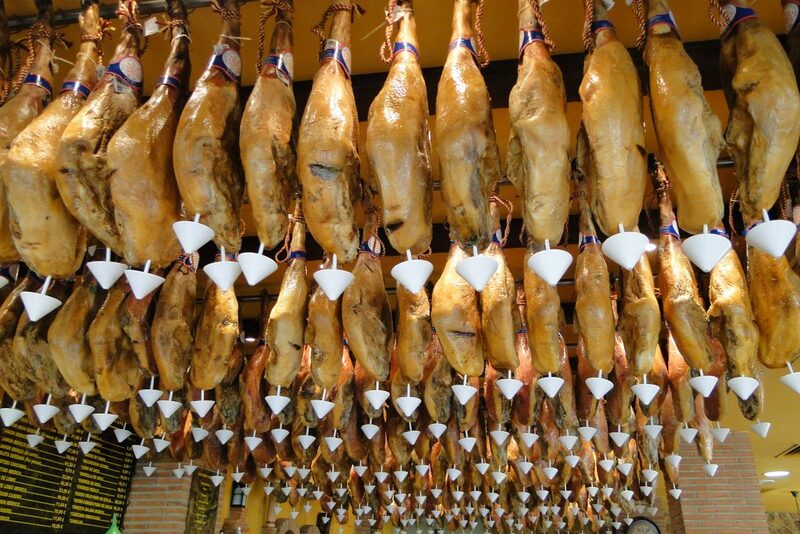 Ceiling display of Jamon Serrano and Jamon Iberico, Granada, Spain. Wikimedia Commons. What is this? “Gastronomic racism,” “Gastronationalism,”5 “Culinary xenophobia”? Perhaps “pork supremacy” is more appropriate – and it’s nothing new in Europe. The flavours of frying lard and pork stew were equated with Christianity in medieval times. European inquisitorial bodies used the eating of pork as a sign of true conversion to Christianity on the part of Jews and Muslims. For Christian conquerors in the Iberian Peninsula, the smell of frying with olive oil, encountered in the Southern province of Andalusia, indicated false conversion. Cooking with pork and displaying salami or jamón (cured pork meat) was a safe strategy for new converts to demonstrate their true allegiance and avoid encounters with the Inquisition. Today, displaying jamón is still a national sport in Spain. Pork was an enticement to, and a sign of, true conversion. “Lard and jamón converted more Jews to Christianity than did the Inquisition” [Más judíos hizo cristianos el tocino y el jamón que la Santa Inquisición]. Today, the protagonists of Somali-Italian Igiaba Scego’s short story “Salsicce”, or the Catalan-Amazig Najat El Hachmi’s The Last Patriarch, feel the pressure to eat pork in order to prove their sense of belonging in Italy and Spain to their co-workers and neighbors. According to Gabbaccia, food “provides arenas where particularly rapid cultural accommodations between natives and newcomers can occur.”7 The Lega Nord was thus trying to prevent natural fusion and mixing. A growing appreciation of food among those who distrust genetically modified foods and large agribusiness, and who want instead to support local food and the 100-mile diet, is also fuelling local and regional pride, which can easily be used by nativists against “foreign cultures”. Unless, of course, locavores and pro-diversity agents find common ground. Visual artist Leone Contini is questioning the dichotomies local/global, native/foreign in his TuscanChinese project. Mediterranean culinary traditions are, however, much larger than pork. There is plenty to choose without the need to exclude gastronomic minorities. Mohammed Chaib, former member of the Catalan parliament, proposed using the Spanish omelette, a popular dish made with egg, onion and potatoes, as a national symbol that could unite all but vegan Spaniards. The other contender as a national food, the controversial jamón, would of course exclude all non-pork eaters and environmentally minded omnivores. In the Tuscan tradition, at least half of the regional specialties to try when visiting Florence are pork free and many of them would even entice vegans. Bistecca alla fiorentina (steak), lampredotto (cow’s stomach stew), crostini toscani (chicken liver on toasted bread) are good for all omnivores, as long as animals have been slaughtered following ritual practices. Lard from Colonnata is only for real pork lovers, while panzanella (bread salad), ribollita (bean and vegetable stew), and pappa al pomodoro (bread with tomato sauce) are universal dishes. Would it be un-Tuscan to serve universal dishes at schools and leave pork for the private sphere? In 2015, the World Health Organization made waves in Spain after suggesting that red and processed meat were linked to cancer. Jamón lovers took print and online fora by storm and confirmed their commitment to meat, claiming jamón as if it were a human right. We’ve lost the memory of it being a privilege and a rare treat merely three generations ago. Today it is a daily staple in most Spanish households. Meat, however, is a luxury item with high environmental costs. By thinking of pork not only as a right, but also an obligation to be consumed by minorities in Europe, we are deepening the environmental and health challenges we currently face. If we were to return to the days when we mostly followed a Mediterranean diet, with pork and meat as indulgences for rare occasions, Europe would become a more inclusive society for vegans, vegetarians, and non-pork eaters without being any less European for it. 1. Donna Gabbaccia, “Immigration and American Diversity: Food for Thought,” in Reed Ueda, A Companion to American Immigration (Oxford: Blackwell Publishing, 2006), 444. 2. Caterina Pasolini, “Scuola, aggiungi un pasto a tavola: oggi a Milano un ‘menù universale’ per i bambini di tutte le fedi,” La Repubblica, October 28, 2015. 3. Angelique Chrisafis, ‘Pork or nothing: how school dinners are dividing France,” The Guardian, October 13, 2015. 4. Betz, Hans-Georg, and Susi Meret. “Revisiting Lepanto: the political mobilization against Islam in contemporary Western Europe.” Patterns of Prejudice 43, no. ¾ (2009): 313-334. 5. DeSoucey, Michaela. “Gastronationalism: Food Traditions and Authenticity Politics in the European Union,” American Sociological Review 75, 3 (2010): 432-455. 6. Benedetta Grasso, “Polenta vs Cous Cous. Legally Banning Ethnic Food from Northern Italy,” i-Italy, April 9, 2010. http://www.iitaly.org/13883/polenta-vs-cous-cous-legally-banning-ethnic-food-northern-italy. 8. Ben Knight, “Berlin Kebabs are a culinary universe,” DW, July 22, 2011. http://www.dw.com/en/berlins-kebabs-are-a-culinary-universe/a-15256526. Confronting Canadian Migration History by Aitana Guia is licensed under a Creative Commons Attribution-ShareAlike 4.0 International License, except where otherwise noted.